This is the start of improving the BlogIt user interface, and making the admin workflow smoother. Many of the typical admin functions now use Ajax, which allows an action to take place without having to reload the page. That means rather than clicking to approve a comment, and waiting a few seconds for the page to reload, the approval is 'immediate! So, approving, unapproving, and deleting comments now happens instantaneously. You click the delete comment link, and it will disappear before your very eyes. Also in this release are a few new user requested features, like the ability to block commenters by adding their IP addresses to the PmWiki Blocklist, delete blog entries (available in the admin links for blog entries), and more visible and more immediate error messages for things like leaving out required fields, and formatting url's and emails' incorrectly. Thanks to Luigi who uncovered a few bugs, and also made a few suggestions for improvements. Always nice to have some active involvement from the users of BlogIt. For the next release I think we'll get a new control panel, and some additional admin ajax functions (like previews maybe). I'm also going to be checking out a few other blogging platforms to see what's changed over the last few years, and see what we might make use of as BlogIt evolves. Feel free to add your comments and requests over on the BlogIt talk page. 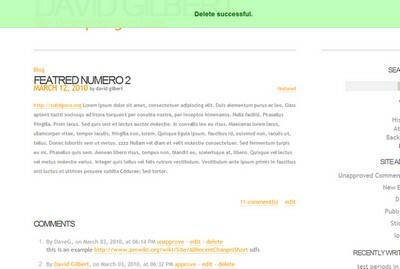 I'm also interested to know if you use BlogIt to run your site over on the BlogIt users page.